Good/Bad – Um? Depends what your looking for. I’d prefer simple sync and complex sync. The master ppl file setup – I love. Each pump’s code is a separate file – that’s great programming technique. Makes it easy to test each ppl file separately. Syncing – Simple syncing is done by you pressing the run all button. If you can create 3? 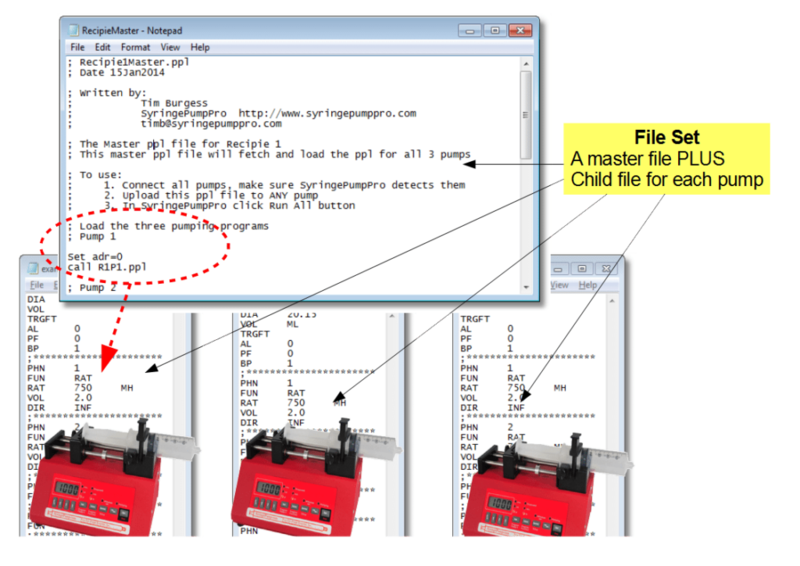 pump ppl files that deliver the right out comes from time 0 for each individual pump – t0 is when you click run all. That’s the simplest way of doing it all or looking at it all. It means your need are simple. Now within each pump program – you can use timing loops. For for other kinds of sync – complex sync – wait till some outcome from pump 0 then tell pump 1 to start – that needs ttl cables and signals. It’s the only way to go. You cant command one pump from another pump via the RS232 network connection. This does happen in a reciprocating pump set up – one pump becomes the controller in that network – but it’s not possible for us to write ppl for that environment. 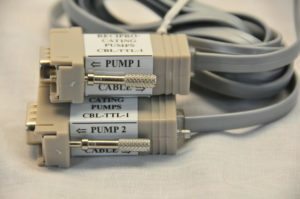 You will need ttl cables – that’s great for 2 pumps – but if you have 3 or more pumps – then you need a scheme such as … pump 0 ->ttl->pump 1-> ttl->pump2 but you’ll need custom made ttl cables for this. It’s possible for pump 4 to be the input to pump 1 – and you can make a pump circle configuration. I’ve done that – challenging but when it works. yes! You can also trigger more than one pump from a single pump and with some electronics you can trigger more than one pump from more than one pump. I have done that sort of thing and it works brilliantly BUT you have to make your own cables for that – you cant buy that cabling. Hey and when it all works – you will smile and bathe in your triumph – you’ll see.